Over at Yahoo!, Drexel Perry hypothesizes that Washington could be a free agent destination for Knicks forward Carmelo Anthony. Unfortunately, it’s a bad idea for the Wizards, and it’s highly unrealistic. Why would it be a bad move for the Wizards? 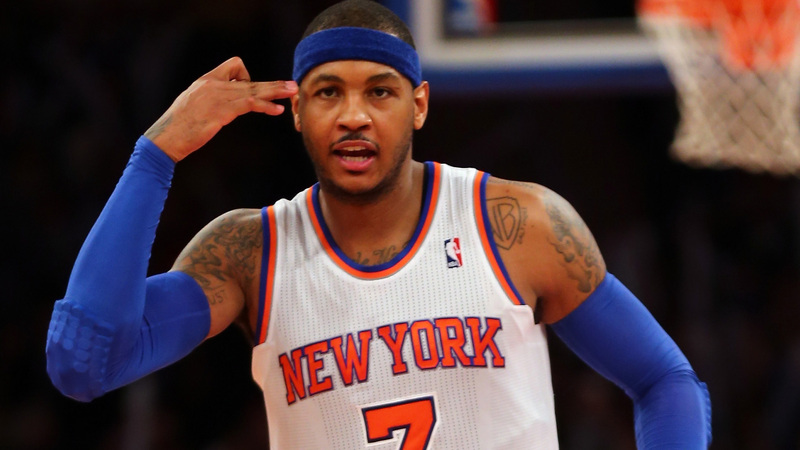 Simple: Anthony may be the game’s most overrated player. He continues to be touted as a superstar, but as I’ve written elsewhere, he’s more of a media star and fan favorite than a win producer. Folks believe Anthony is a star because he scores a TON of points. And, he scores a ton of points because he shoots a lot. So yeah, Anthony is a big time scorer. But, his efficiency is only okay, in part because he seems to believe extra points get awarded for attempting difficult shots. (Note: they’re not.) For a more in-depth look at Anthony’s scoring, click here to jump to a piece I wrote at my old blog. While Anthony does score a lot, scoring in only one aspect of what wins and loses basketball games. When looked at through the lens of a measure that accounts for a player’s overall effect on his team’s ability to win or lose, Anthony rates as a good — but NOT elite — player. In Player Production Average (PPA)*, MVP candidates typically score solidly over 200 (where 100 = average and higher is better). All-NBA candidates usually rate 160 or better. Anthony’s best season (last year) rates a 162. That’s good, but not elite, and not worth the $20+ million salary he’s getting now, and definitely not worth the $22 million Perry suggests the Wizards offer. * PPA is a stat I developed to account for what causes winning and losing. It’s pace neutral, includes defense, and has a degree of difficulty factor based on the level of competition a player faces. Perry’s analysis of the team’s hypothetical on-court workings is okay. A small-ball approach could work — Anthony just had the best season of his career playing mostly at PF. Nene could (at least in theory) play center. Otto Porter projects to be a good NBA small forward. For my tastes, Perry should have given more (some?) attention to the reality that both Anthony and John Wall are ball-dominant. Wall, of course, is a willing passer. Anthony — not so much. The other big problem is counting on an aging Nene at center. Fact is, the big Brazilian is in the “expensive decline” phase of his career — witness him talking about “pushing through” soreness after the team’s second pre-season game. Anthony would also turn 30 before the 2014 season begins, which means the Wizards would (once again) be purchasing the wrong end of a player’s career. The money that currently counts against the salary cap occupied by Trevor Ariza and Emeka Okafor could simply be used to bring Anthony to Washington in 2014. Ariza and Okafor combined cap dollars of approximately $22 million will come off the books next summer. That could easily be enough to lure Anthony to Washington. By becoming a free agent, Melo’s already taking a discount because only New York can offer him a max five-year deal for $129 million. So Washington’s potential offer could be in the neighborhood of what teams other than the Knicks can bring to the negotiating table. But no — this is simply erroneous. The Wizards are over the salary cap. They don’t get to just plug a new salary into the combined slots of departing players — they have to fit new salaries under the cap. If Washington lets Okafor, Ariza, Vesely, Booker, Seraphin and Singleton depart, they’d have total salary of $43.9 million vs. a cap of roughly $59 million. The picture isn’t even that rosy, however. They’d still need to account for their first round pick, as well as cap holds for empty salary slots. To pay Anthony $22 million, they’d need the Knicks to cooperate in a sign and trade, or they’d need to dump another $8-9 million in salary. Not gonna happen. So, forget about Anthony. He’s overrated, brutally expensive, and will be on the wrong side of 30 by the time he’s even the remotest of possibilities. And, the Wizards don’t have the cap space or the resources to acquire him without detonating long-term assets.